Back to Basics: The Weekly Savings Jar Idea. So a Facebook friend messaged me today. Alison shared with me what she does to save physical cash. She sets herself a weekly cash grocery budget and if she hasn’t used all her budget up she puts the remainder in a savings jar. She does this each and every week. So today, after hearing of Alison’s idea, I got cash out of the ATM and put my monthly budget into a jar and worked out what I could withdraw every week from the jar and keep in my purse for daily expenses. Looking at my monthly budget I created I could see that that the total amount designated for groceries, household (toilet rolls, bin bags, toiletries etc), entertainment and petrol/travel was £280 per month. This includes the £15 per week I spend on an organic veg box from www.riverford.co.uk (which comes out of my bank account). So taking off the £60 for my veggie boxes that leaves £220 for 4 weeks for all of the above. Each week I will put £55 physical cash in my purse and pay by cash and see if a few £’s remain at the end of the week for the cash savings jar. I’m determined to face this year head on, as prepared as I can be, work any overtime if I can, take control and feel safe again. This entry was posted in Back to Basics. Bookmark the permalink. I’m getting brutal with my budget. I’m cutting back to the bare bones and automating payments for all bills. Any extras(outside meals, entertainment) will be paid out of the $40 I’ll take out of the bank at the beginning of the month. The library is an excellent resource. I can use internet, get books(including ebooks) and movies. Oh, something I forgot to mention, I got an Amazon gift card for Xmas and I use it to buy myself a 3 month membership to amazon prime. I suspended my Netflix and Hulu streaming services and will stream from Amazon for those 3 months. Sounds like a win win situation to me Carolyn! What a great idea. I am anxious to see how this works out! I think I may give it a go with you! It will be hard because online shop is such fun! Yes…good idea. 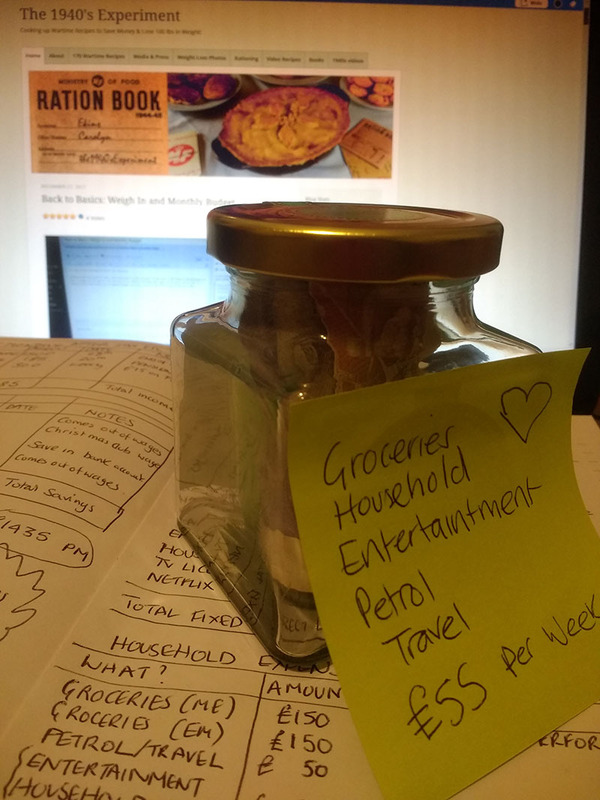 Having given this some thought I’m going to increase the amount of jars but keep it simple and divide my household cash expenditure between three. £50 a month for petrol/travel/anything car related. I’ll put those three amounts in the three jars and take the weekly amount out every week from each and clip these in my purse. Great idea, Carolyn! I’m sure you will be successful! New year, new you! I’m doing the same for this year. I did this years ago and it worked well for a while. I find that like with eating properly, sometimes something that works just doesn’t fit right anymore and I have to change to a different way of doing things but a few years later can go back to the old way again. I actually broke it down to days. If I remember correctly I had a tenner a day but for the weekend, just had whatever I hadn’t spent during the week. This time I feel like I need to start with so much per week that I’m guaranteed to not actually spend all of it. Sometimes you need the easy wins. I’ve just signed up for a veg box/CSA-type scheme so that will actually cover the bulk of my food costs. For the first two months of the year I won’t be going out much in an attempt to build up a bit of a buffer from the cash left over every week. Good luck with your jars!